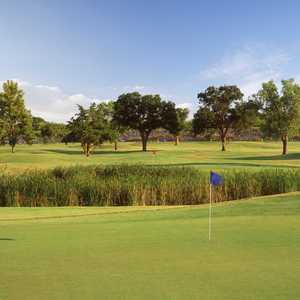 FLOWER MOUND, Texas -- Jack Nicklaus once said Augusta National's No. 12, the scenic, but precarious 155-yard, par-3 over Rae's Creek, was the toughest tournament hole in golf. The ninth hole at Tour 18 Dallas is a simulation of No. 17 on the Stadium course at TPC Sawgrass. Once you have played it you will know why and you don't have to go to Georgia - you can test it at Tour 18 Dallas. As you walk across the Hogan Bridge and view the 10-yard wide landing area you will know why it's tough - most folks are going to play it safe, take too much club and bounce over this tiny green. And behind the hole is another surreal shot coming back if you don't go too far into the azaleas. That second shot will be downhill with the potential to reach the creek if you don't have deft touch. Not only does Tour 18 Dallas have Augusta's No. 12, but it has Amen Corner - Augusta's Nos. 11, 12 and 13 - which are the finishing holes at Tour 18 and alone worth a day playing these famous hole simulations. Actually Tour 18 Dallas isn't in Dallas. It's in the rolling hills of Denton County, 35 miles from downtown Dallas and 30 miles from downtown Fort Worth. Since it opened in 1995, Tour 18 has been a hit. More than 59,000 golfers a year play the course and play is so heavy in April, May and June that shotgun starts are used. But everything hasn't been rosy for Tour 18. There was a tumultuous time when Sea Pines Resort on Hilton Head Island, Pebble Beach in California and Pinehurst in North Carolina sued Tour 18 because it replicated their golf holes and marketed the names to draw golfers. Tour 18 uses the following disclaimer in its literature: "Permission for simulating the original holes from these courses has not been given to Tour 18, nor do the owners of these courses endorse, sponsor, approve of, or affiliate with Tour 18." The result of the lawsuit was a federal court's decision that blocks course developers from using the trademarks of more famous golf courses and resorts. At Tour 18 Dallas and Tour 18 Houston the red and white lighthouses constructed on the Harbour Town Golf Links simulations were removed and in the yardage book that hole is simply described as Tour 18 No. 7, instead of Harbour Town No. 18. The plaintiffs in the lawsuit agreed they couldn't stop Tour 18 from copying the holes, but they could stop them from using the names of Pinehurst, Pebble Beach and Harbour Town in their brochures. But there are others who say Tour 18's use of the names would only help the plaintiffs - that after a golfer plays a famous hole at Tour 18 he would want to play that course when given the chance. Although the lawsuit slowed immediate construction of more Tour 18's, Mike Reeder, General Manager of Tour 18 Dallas, says talks are presently under way for expansion. 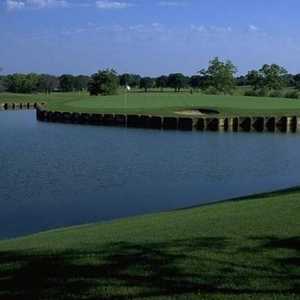 The original was built in Humble, Texas, called Tour 18 Houston. "We are in negotiations with the former owner and are looking at different sites - San Antonio, Phoenix, Las Vegas, Ventura County in the Los Angeles area, Washington, D.C. and Orlando," Reeder said. "There are a lot of people who want to play these kind of courses." Reeder said Tour 18 Dallas will be introducing use of caddies as an amenity in the next couple of months. "We will also address the pace of play and try to improve that," Reeder said. "If we have to add some player's assistants we will. We are adding more fans for the bentgrass greens and will be redoing the bunkers." Keith Fancher, Assistant GM, said: "Lots of people were skeptical about the Tour 18 philosophy, but others have told us this is a true test of golf. Some have even said this would be a great golf course just on its own, without knowing about all the famous holes. We like to think we give great customer service, from the bag drop to the end of the day, and that all the golfers will think they have had an upscale experience." Managed by Arnold Palmer Golf, Tour 18 Dallas does something few courses do in the Dallas area - they overseed in winter wall-to-wall, not just tees and greens. The ParView GPS system is another first-class amenity. "This is my second round here," said Jim Linker of Lewisville. "I like the feeling of playing famous golf courses, especially Augusta. 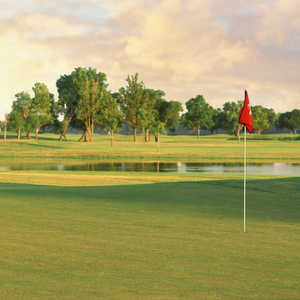 And for me, one who has never been to these famous golf courses, it serves my needs. The course is in good shape in the summer, but you have to be patient with the shotgun starts, play can get slow." Tour 18 No. 1 is a simulation of Cherry Hills No. 1 in Englewood, Colorado. Par 4, 401 yards. In the 1960 U.S. Open, Arnold Palmer began his final round seven strokes behind the leader. After driving the par-4 first hole, Palmer fired six birdies over the first seven holes. He shot 30 on the front nine and 65 for the round to capture his sole U.S. Open Championship. Tour 18 No. 2 is a simulation of Baltusrol No. 8 in Springfield, New Jersey. Par 4, 374 yards. The "changing of the guard" took place at Baltusrol when Nicklaus outdueled Palmer to win the 1967 U.S. Open. His record score of 275 would stand for 13 years until his return to the 1980 U.S. Open at Baltusrol, where he shot 272. Baltusrol has played host to a record seven U.S. Opens. Tour 18 No. 3 is a simulation of Doral No. 18 in Miami, Florida. Par 4, 435 yards. The 18th hole at Doral, known as the "Blue Monster," is consistently ranked as one of the toughest finishing holes on the PGA Tour. Two-time Doral Open winner, Raymond Floyd, describes the hole as the "toughest par 4 in the world. Players going for the championship will need to hit two perfect shots to this narrow green." Tour 18 No. 4 is a simulation of Crooked Stick No. 15 in Carmel, Indiana. Par 5, 507 yards. In 1991, Nick Price withdrew from the PGA Championship at Crooked Stick. That gave the sixth alternate, John Daly, the opportunity to play in his first major championship. Little known Daly overpowered the veteran field and Crooked Stick to win his first PGA Tour event. The green is very unique - horseshoe- shaped with a bunker in the middle of the U. Tour 18 No. 5 is a simulation of Winged Foot No. 10 in Mamaroneck, New York. Par 3, 195 yards. Winged Foot is considered one of the most difficult courses in the country and was the site of the 1997 PGA Championship. In the 1974 U.S. Open, Hale Irwin won the championship with a score of seven-over-par. Architect A.W. Tillinghast considers the 10th at Winged Foot the finest par three he ever built. Bobby Jones, Hale Irwin, Billy Casper and Fuzzy Zoeller have all won U.S. Open titles there. If you are above the hole the putt is almost impossible. Tour 18 No. 6 is a simulation of Medinah No. 10 in Medinah, Illinois. Par 5, 582. Tommy Armour referred to Medinah as "an examination in golf, as fine a test of golfing as one could ever find." With a course rating of 77.3, the "Monster," as it has been appropriately named, has hosted numerous major championships including the 1949, 1975 and 1990 U.S. Opens and the 1999 PGA Championship won in an historic fashion by Tiger Woods over Sergio Garcia. Tour 18 No. 7 is a simulation of Harbour Town's No. 18 on Hilton Head Island. Par 4, 470 yards. The lawsuit prohibited Tour 18 from using the name and made them remove the red and white lighthouse. A 200-yard tee shot down the right side of the fairway is required to carry the marsh and get the ball in position for a delicate second shot to the tiny green. Pars are a welcome score on this long hole. Tour 18 No. 8 is a simulation of Oakland Hills' No. 16 in Birmingham, Michigan. Par 4, 409 yards. Gary Player tamed this monster in the 1972 PGA Championship. His 9-iron shot over a willow tree and a lake to within four feet of the pin is considered one of the greatest shots under pressure in golf history. With a great tourney history, Oakland Hills has played host to five U.S. Opens and two PGA Championships. Tour 18 No. 9 is simulation of Sawgrass No. 17, the island green hole in Ponte Vedra, Florida. Par 3, 132 yards. This is the most photographed hole in golf. Architect Pete Dye designed this famous island hole to ensure that even the biggest of leads would not be able to "limp home." John Mahaffey called it "the easiest par 5 on the course." Sawgrass plays host to the Tournament Players Championship. Tour 18 No. 10 is a simulation of Oakmont No. 3 in Oakmont, Pennsylvania. Par 4, 425 yards. Oakmont, established in 1902, has played host to 15 major championships, more than any other course in America. In 1973, Johnny Miller closed with a final round of 63 to win the U.S. Open. Miller's 63 stands as the course record and ranks as one of the greatest finishes in Open history. Many have referred to that round as "the best round of golf ever played." Tour 18 No. 11 is a simulation of Southern Hills No. 12 in Tulsa, Oklahoma. Par 4, 445 yards. The 12th at Southern Hills consistently appears on Golf Digest's list of Top 100 holes in the country. Arnold Palmer included this hole in his book of favorites. Southern Hills has hosted two U.S. Opens and three PGA Championships. this hole in a book of his favorite holes in golf. Robert Trent Jones called the view of the green "spectacular and frightening." Tour 18 No. 12 is a simulation of Riviera No. 6 in Pacific Palisades, California. Par 3, 170 yards. In a span of 17 months, Fort Worth's Ben Hogan, known as "Hawk" captured two L.A. Opens and one U.S. Open at Riviera. From that time forward, Riviera has been known as "Hogan's Alley." The 6th at Riviera features the famous "warbunker" in the center of the green, paying tribute to World War I Veterans. Tour 18 No. 13 is a simulation of Pine Valley No. 17 in Pine Valley, New Jersey. Par 4, 338 yards. One of the best holes at Tour 18 Dallas. Pine Valley is perennially ranked as the best course in the world. Designer, George Crump, became obsessed with the idea of constructing the finest, most difficult course in the world. Every fairway and green is set off by the sand and scrub that characterizes the region, effectively forcing players to play from one island to the next. Tour 18 No. 14 is a simulation of Firestone No. 16 in Akron, Ohio. Par 5, 625 yards. The 16th hole at Firestone is one of the most difficult holes on the golf course. The pond in front of the green and its length of 625 yards makes it an improbable green to reach in two, but not impossible. Nicklaus and Daly have reached this green in two while competing in the World Series of Golf, an annual meeting of the globe's best players. Tour 18 No. 15 is a simulation of Muirfield Village No. 17 in Dublin, Ohio. Par 4, 430 yards. Muirfield Village is regarded as "The Course That Jack Built." Nicklaus named the course after the Scottish links upon which he won his first British Open in 1966. Muirfield Village plays host of the PGA Tour's Memorial Invitational which is considered "The Masters of the Midwest". Tour 18 No. 16 is a simulation of Augusta National No. 11, the start of Amen Corner in Augusta, Georgia. Par 4, 455 yards. This hole boasts one of the most feared second shots in golf. Hogan once said, "If you ever see me on this green in two shots, you'll know that I have pulled the shot." This is the first hole of "Amen Corner" where Tiger Woods birdied to propel him to a record score of 18 under par for the tournament in 1997. Tour 18 No. 17 is a simulation of Augusta National No. 12. Par 3, 155 yards. Many Masters dreams have vanished into Rae's Creek guarding this tiny target. In the 1982 Masters, Tom Weiskopf came to this hole with the lead and left with a score of 13. Tour 18 No. 18 is a simulation of Augusta National No. 13. Par 5, 485 yards. The 13th at the Augusta National Golf Club is the final hole of "Amen Corner". In 1937, Byron Nelson sank a 50-foot eagle chip here in route to his first Masters title. Tiger Woods used a driver and mid-iron in the 2nd round of the 1997 Masters to take the lead for good. Greg Norman and Curtis Strange call the 13th the greatest hole in golf. My buddies and I played the course on Feb. 28th 2009. The course was in really good shape, the bunkers were PGA tour quality. Greens were a bit inconsistent in their speed, but they were in good shape. They still have problems with the slow play, the 10th tee box was 3 groups deep when we got to it. Just allow your self a good 5 hours to play the course to be safe. All and all, we had a great time, I would love to go back during the late spring, early summer when the landscape is green, especially Amens corner, the landscape was in great shape for those 3 holes.